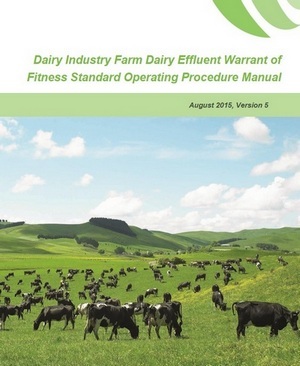 Questions and Answers for Farmers regarding the Dairy Effluent WoF programme. There are several reasons why you might find this valuable. A lot of farmers have upgraded their effluent systems themselves and it might be a good idea to get it thoroughly checked over as you may not be aware of all the rules that you must comply with. If buying or selling a farm great to get an independent person to prepare a comprehensive report then you know what is needed to upgrade. For a sharemilker moving onto a farm being able to see a ‘WoF’ report means you know what kind of system you’re taking on. There are other people offering a similar service, why use a Certified ‘WoF’ Assessor? There are likely to be others offering the service and they may well be excellent. However, the assessment developed for the Certified ‘WoF’ assessors is very thorough, consistent, and using the same methodology every time. One of the problems in assessing effluent systems is getting consistent advice. Why isn’t there a pass/fail system? There is no legislation or regulations around this dairy effluent ‘WoF’, it is a voluntary programme sort of like a building inspection. The assessor checks over the entire farm where there are areas that effluent collects and the corresponding infrastructure, including feedpads, underpasses , storage ponds and the irrigation network as well as a lot more. This is a more thorough assessment than either of these and designed to be very practical and also diagnostic. It takes 3-4 hours to complete. For instance the assessor will insert a flow meter and pressure gauge into mainline as that helps identify if there is a problem with the pump. They carry out a full inspection of your irrigator and test the application depth and average rate. They also calculate the amount of storage you have for the type of effluent management system on the farm. If a bit low then the advice might be to increase your effluent area or look for some water savings for instance. Do I have to do anything based on the report? Because this is a service you purchase, it is entirely up to you what you do with the information provided. But it would be worth taking note of any areas of non-compliance pointed out in the report. What kind of information do I get back for my money? After the assessor has completed their assessment they will send you a report that shows the good things they saw on farm and any areas of risk or concern, why this was problem and some suggested actions. At minimum they have all attended a three day training course and then gone through competency assessment tests. All the Certified ‘WoF’ Assessors have several years of experience in assessing effluent systems. How do I find a certified ‘WoF’ assessor? See our page of Certified ‘WoF’ Assessors and read the brief bio of each of them and then select the assessor that best suits your needs. What if there is no Certified ‘WoF’ assessor in my region? Many of the assessors also travel to other regions, please just get in touch with a couple and you will likely find someone who is prepared to travel, especially if they happen to be in your region for other assessments. How is this different from using Accredited designers? No, all the information that is gathered is stored in a central database at QCONZ. It is only used to analyse trends on farms over time and to see if there are any areas of concern seen on farm that the dairy industry needs to focus more attention on. It’s just a matter of calling up your local Certified ‘WoF’ assessor and making a time for them to come out? They’ll make sure you are fully informed in terms of what information they need from you and what areas of the farm they need access to. Health and Safety on Farm? The Certified ‘WoF’ assessors will wear fluoro vests and will always let you know where they are on farm. As the host farmer you should point out hazardous areas that they need to be careful of. They will not go out on pontoons on ponds as they are too hazardous. During their assessment if they see areas that concern them in terms of health and safety they will point that out in their report to you. The cost will vary between assessors, it will pay to ask them what it is likely to cost, most will have a base hourly rate and travel costs. Anywhere between $600 and $1100 depending on distance travelled. They run a business so need to cover costs of running a four wheel drive vehicle, all the gear for testing and on-going costs of being Certified ‘WoF’ assessors. If I have no storage currently should I bother getting a ‘WoF’ done? If you have no storage but have an irrigation network and spraying effluent onto land then you might find it useful to see if your system is performing well. You will need to plan for storage but you might find it useful to see what else you may need to upgrade. How much time does it take for the dairy farmer? The ‘WoF’ assessor will set up a time to come onto the farm by telephone or email and there is some information that they need to collect from you that may take about 30 minutes or longer depending on the time you wish to spend with the assessor. They will inform you but usually they would like to see a copy of your consent (or they will know the permitted activity rules), nutrient budget (as they check the nutrient loadings to ensure meeting the rules). It would pay to also know how much water you use in the shed each day and general usage of feedpads and stand-off pads etc. It is recommended that you get an assessment done every three years. 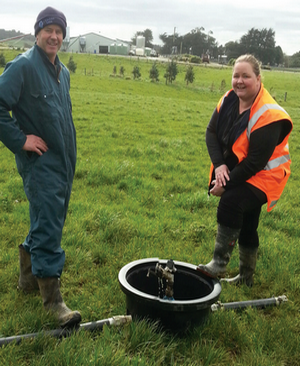 "The WOF process was well worth the money spent on it, given the significant capital involved in getting effluent systems right." "You need advice that has your best interests at heart, that enablves you to make choices that best suit your system, not a certain piece of equipment or process." Know if the system is fit for purpose or if you need to factor upgrades into the offer. Find out what the risk is for your farm. Find out how well the effluent system is performing and reassurance that your system is fit for purpose. An independent person who assesses the current system will help with decision making. Corporate Board members and absent owners can be liable if there is inadequate effluent infrastructure on a farm.